Top show jumper Beezie Madden has been paired with Cortes C since 2011. He is a 2002 Belgian Warmblood gelding. With wins at the Ruby et Violette WEF and the FTI Consulting WEF, they went on to clinch victory for the US in the Furusiyya FEI Nations Cup, and another in the The Longines King George V Gold Cup. At the 2014 Alltech FEI World Equestrian Games, Cortes was ridden in the "Final Four" competition, jumping four clear rounds and earning the "Best Horse" title, and Madden the bronze medal. In honor of Cortes C, Breyer will be making a donation to The Center for Family Safety and Healing, which supports victims of domestic violence. Model measures 12.25"L x 9"H.
This Belgian Warmblood is a champion show jumper ridden by Olympian Beezie Madden. He earned the "Best Horse" awared at the 2014 Alltech FEI World Equestrian Games, and was later voted 2014's International Horse of the Year by the United States Equestrian Federation. Authentically-sculpted and hand-painted, Cortes C sports a stunning black coat, and a star and strip on his face - just like the real horse! 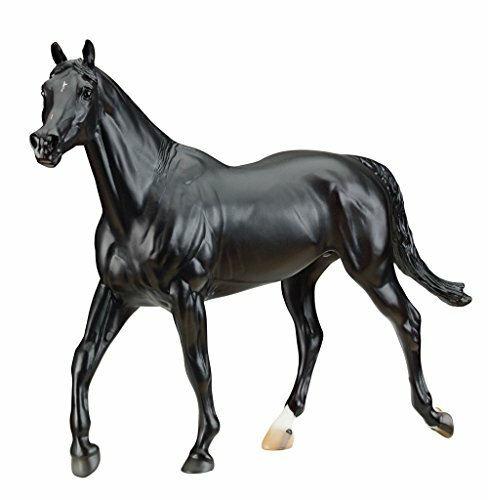 This Breyer collectable is strong enough for creative horse play, and beautiful enough for display! Genuine Breyer Tradtional models are 1:9 in scale, and Cortes C is 9" tall. View More In Model Animals. If you have any questions about this product by Breyer, contact us by completing and submitting the form below. If you are looking for a specif part number, please include it with your message.